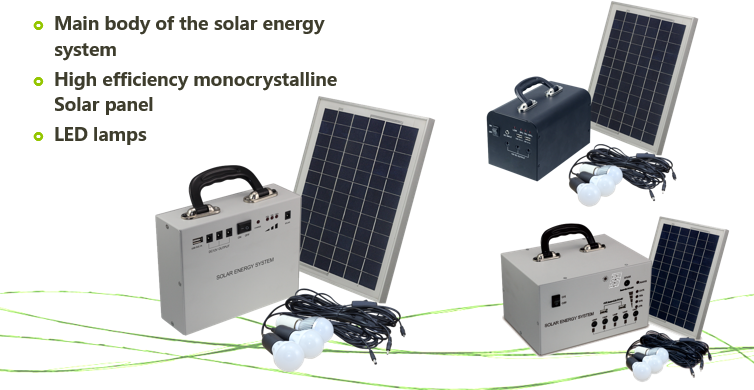 Product categories of Solar Portable Energy System, we are specialized manufacturers from China, Solar Systems, Solar Energy Systems suppliers/factory, wholesale high-quality products of Solar Power Systems R & D and manufacturing, we have the perfect after-sales service and technical support. Look forward to your cooperation! * This portable solar system consists of solar module, rechargeable battery, controller, cabinet as well as a series of accessories such as cigar lighter plug and fuse, which can convert solar energy into electricity power and store it into battery. When needed, the power can be obtained via the universal built-in Socket of the system.the solar generator is widely used in household lighting, outdoor working, fishing boats, field working,etc. *Concept: This small portable solar energy system is one of eco-friend and efficencey New energy application products with safety, simply using and easily carrying. It's a necessary for emergency, outdoor activities and green life. *Working principle: the light energy produced by the solar panels which convert the sun's energy into electricity to store in batteries, then the battery support LED lighting, digital products charging, or other electrical equipment using.